9Apply for Population Welfare Department Punjab Jobs 2019 Latest Vacancies. Reputed department of Punjab named as Population Welfare Department is looking to recruit the professional, eligible, hard working and suitable applicants for the ADP Scheme "Multi-Sectoral Population Welfare Programme, Punjab (2018-20)" and the following posts need to be filled as soon as possible. 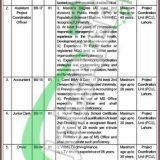 Jobs in Population Welfare Department Lahore are such as (Project Coordination Officer, Assistant Project Coordination Officer, Accountant, Junior Clerk, Driver, Naib Qasid) are the posts which needs to be filled as soon as possible. The appointment will be done on contract basis for one year which is extendable on satisfactory performance of an individual. The only Male having a domicile of Punjab are welcome to apply. Candidates willing to apply for the position are suggested to read the criteria carefully and according to the criteria candidates holding Masters to Matric/Middle from a recognized board can apply. Age limit should be 25-40 years. So, for interested and eligible candidates we'll discuss how to apply procedure in the very next heading. Applications along with required with attested copies of educational certificates, experience certificate, diplomas, domicile, CNIC, three recent photographs should reach through registered post to the following address given below. Position applied for should be mentioned clearly on the envelope. Applications received after due date will not be considered and will be rejected. Candidates should bring original documents at the time of interview. For more jobs in Pakistan please visit our site JobsAlert.pk. Address: Directorate General, Population Welfare Department, Punjab 14-Babar Block, New Garden Town, Lahore.